This follows a broad Pentagon and deep state backlash in reaction to last week's sudden White House announcement of a "full" and "immediate" pullout of the some 2000+ American military personnel training and advising Kurdish-Arab SDF forces in north-east Syria (in October the commander of the Special Operations Joint Task Force Operation Inherent Resolve let slip that there were actually 4,000 troops in Syria, but quickly tried to walk it back). Quickly on the heels of the decision Trump's senior aides noted the decision was made after a phone call between Trump and Erdogan on December 14th, and curiously the U.S. State Department approved the sale of $3.5 billion in patriots missiles the day after. 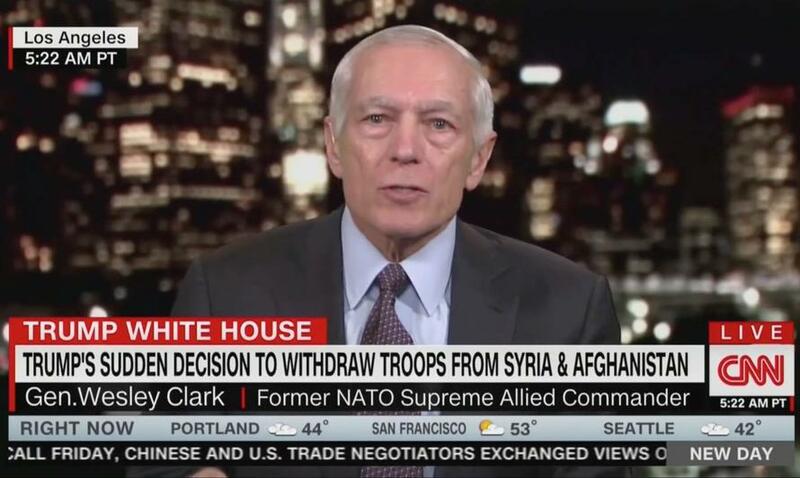 Gen. Clark said on CNN's "New Day": “There doesn’t seem to be any strategic rationale for the decision. And if there’s no strategic rationale for the decision then you have to ask, why was the decision made?" And he followed with: "People around the world are asking this and some of our friends and our allies in the Middle East are asking, did Erdogan blackmail the president? Was there a payoff or something? Why would a guy make a decision like this? Because all the recommendations were against it." Clark further slammed Trump for weakening relationships with allies around the world, including with NATO: “What the United States had going for it [was] the reputation of reliable consistency — that we were going to be there through thick and thin. The decision on the spur of the moment as the president made undercuts all of that,” Clark said. That kind of decision sends a message around the world to South Korea, to our allies at NATO, to Japan. When the going gets tough, or for whatever reason no one can understand, suddenly a tweet comes out, the policy has changed. This is a really dangerous time for the United States and foreign policy because of this. The White House has long pushed for the Saudis to step up spending on the coalition mission in Syria, and is now attempting to reassure the world there will be no power vacuum in eastern Syria once the Pentagon withdraws. Did we just witness a grand bargain for Syria struck based on US exit?